On Thursday, Dec. 10, the 2016 Golden Globe nominations were revealed and while there was plenty of good news for women — for instance, three of the five movies nominated for Best Motion Picture, Comedy or Musical were female led — there was also some disappointment. When it came to the nominees for the Golden Globe for Best Director, no women were nominated. The five nominees are Todd Haynes for Carol, Alejandro G. Iñárritu for The Revenant, Thomas McCarthy for Spotlight, George Miller for Mad Max: Fury Road, and Ridley Scott for The Martian. Now I know what you're probably thinking: What women directed films were even released this year? Good question. There's Angelina Jolie's By The Sea, Pitch Perfect 2, which was directed by Elizabeth Banks, Sarah Gavron's Suffragette, Catherine Hardwicke's Miss You Already, Sam Taylor-Johnson's Fifty Shades of Grey, and The Intern by Nancy Meyers. If you're now thinking, Well, those movies weren't going to get nominated anyway, way to go, because that leads perfectly into my next point. No women directors being nominated for Golden Globes this year isn't significant because of what it says about the quality of the movies being directed by women; it's significant because it brings attention to how few women directors are making movies in the first place. A recent study by the Director's Guild of America showed that "of the 376 films released in 2013 and 2014, 82.4 percent of them were directed by Caucasian males and just 6.4 percent were directed by women," according to Entertainment Weekly. On top of that, only 1.3 percent of films were directed by minority women, while minority men only made up 11.2 percent of the total. And when it comes to the films who take home the big bucks, the numbers are even more disappointing: only 3.1 percent of films with box office returns higher than $10 million were directed by women. What this report does not reflect is what people who love film — even our culture as a whole — are missing when such a disproportionate percentage of films are directed by one gender or one ethnicity. Unfortunately, we don’t have a metric for that. What you will see is what happens when industry employers — studios and production companies — do little to address this issue head on. To show just how clear it is that women simply aren't being hired as directors, take a look at how many women graduate from film school as compared to men. Based on the numbers above, you might assume that a disproportionate number of women are studying film or want to become directors, but that doesn't seem to be the case. Susan Sandler, a faculty advisor at NYU’s Tisch School of the Arts, told MTV that half of the students in the school's film program are women. MTV reports that that number is similar for the program at the University of Southern California, meaning that two of the top programs in the nation have an equal number of women and men film students. See what Barclay means about "studios of production companies" holding the responsibility? 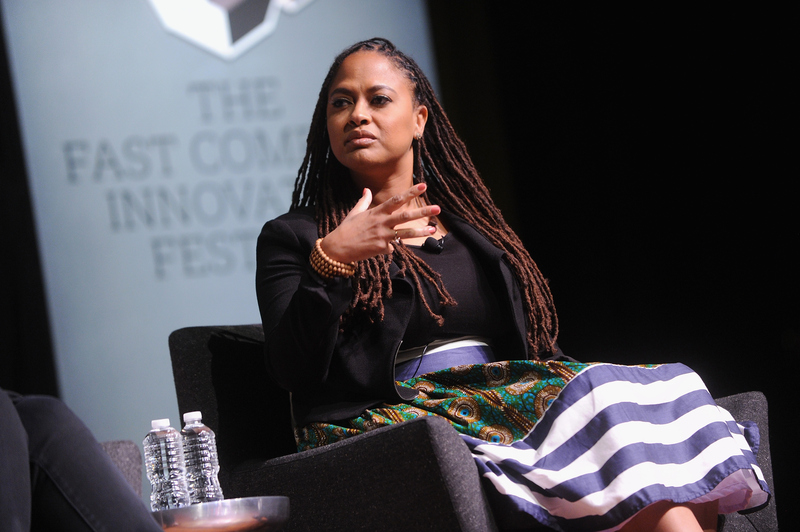 Last year, one women director, Ava DuVernay for Selma, was nominated for a Golden Globe, but no female directors were nominated for Oscars. While it would, of course, be great if there were some diversity in the category once the Oscar nominations roll around this year, the real change needs to be more women getting their films made. Personally, as a woman who loves film, I don't want a woman to be given a throwaway nomination just so that we get the appearance of diversity. 6.4 percent is an incredibly low number of feature films being made by women. Give us real diversity in the film industry and the nominations — and awards — for worthy films will come naturally.